North Korean dictator Kim Jong Un (left), South Korean President Moon Jae-in (right), who said President Trump should win the Nobel Peace Prize. (by Hyonhee Shin, Reuters) SEOUL – South Korean President Moon Jae-in said U.S. President Donald Trump deserves a Nobel Peace Prize for his efforts to end the standoff with North Korea over its nuclear weapons program, a South Korean official said on Monday. Mr. Trump is preparing for his own summit with Kim, which he said would take place in the next three to four weeks. President Trump’s predecessor, Barack Obama, won the 2009 Nobel Peace Prize just months into his presidency, an award many thought was premature, given that he had little to show for his peace efforts beyond rhetoric. Even Mr. Obama said he was surprised and by the time he collected the prize in Oslo at the end of that year, he had ordered the tripling of U.S. troops in Afghanistan. Moon’s Nobel Prize comment came in response to a congratulatory message from Lee Hee-ho, the widow of late [liberal] South Korean President Kim Dae-jung, in which she said Moon deserved to win the prize, the Blue House official said. President Trump on Monday suggested his planned meeting with Kim take place at the Peace House on the border between North and South Korea. U.S. Secretary of State Mike Pompeo said on Sunday that President Trump would maintain a “pressure campaign” of [strong] sanctions on North Korea until Kim scraps his nuclear weapons program. Published at Reuters on April 30, 2018. Reporting by Hyonhee Shin in Seoul; Additional reporting by David Brunnstrom in Washington; Writing by Josh Smith; Editing by Nick Macfie and Alistair Bell. b) In January, to what did President Moon attribute the peace talks between North and South Korea? 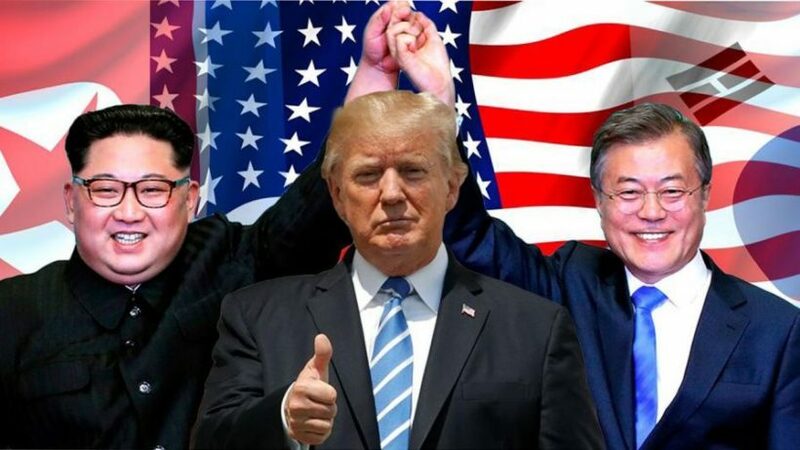 c) When did President Moon call for President Trump to be awarded the Nobel Peace Prize? d) What stance will the U.S. maintain on North Korea until a complete denuclearization deal is finalized? e) President Moon is a lifelong liberal (progressive) whose policies would be more aligned with President Obama or Hillary Clinton. Why do you think he would commend President Trump, while most U.S. media (and even many conservative commentators/“never-Trumpers”) won’t acknowledge the same? f) Should North Korea actually give up its entire nuclear program, do you think President Trump will be awarded the Nobel Peace Prize? Explain your answer.